Ginger has been adopted! 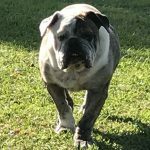 488 days… 488 days living in foster care, watching her foster brothers and sisters come and go… 488 days going to Bulldog event after Bulldog event… 488 days wondering where her forever family was… 488 days without a single person asking to meet her. But today: GINGER/BETTY BOOPS HAS BEEN ADOPTED! 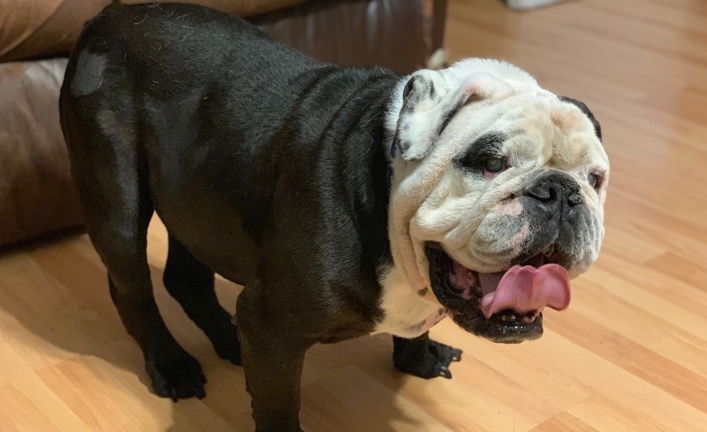 She not only gets a new mom and dad, but an extensive dog-loving family that are all excited to have her join their “pack.” And her new Bulldog brother Winston has welcomed her as well. 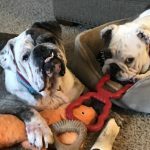 Kim and Mike have made the very unselfish decision to open their home to senior, hard to adopt Bulldogs, knowing they won’t have an entire lifetime with them. 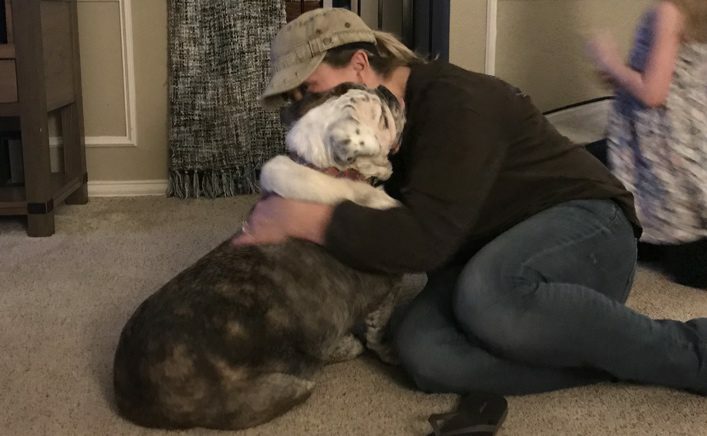 This adoption story is written with tears in my eyes and I will miss my Boops so very much, but knowing that she is with such a loving, fun, happy family makes this adoption so very special. Happy life, sweet sweet Boops. Fred and Ginger were born to dance. But lately there has been nothing to dance about. They were part of a nine dog group rescued from a hoarding situation. 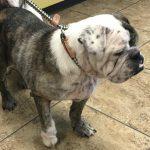 They were covered with fleas and sores over their skin, and bald spots everywhere. Their nails were so long, they curled back under their feet and were digging into their pads. But that life is gone forever! Fred and Ginger are both three years old. 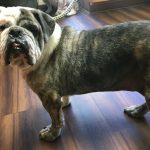 Ginger (the dark brindle and white) weighs 49 pounds and we think she has a torn ACL on top of everything else. Fred (the fawn and white) weighs 53 pounds and has the worst skin with several large sores from rubbing himself raw. They both seem super sweet. They were even playing with a cat at the shelter and one at the clinic. Soon it will be time for them to dance again! 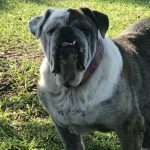 12/17/17 Update: I’m one of the new girls in rescue and even though I was given the name of Ginger, my foster ma can’t stop calling me Betty Boo. She says it just fits me better. 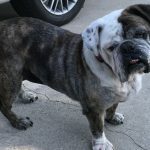 Maybe it’s because I’m such a silly, happy girl and I just love everyone – my foster ma and pa, my foster bro and sissies, and even my foster kitty cats. And I just love to play with my new Christmas toy and Benebone that I got from the generous Santa Paws peoples. Thank you soooooo much! 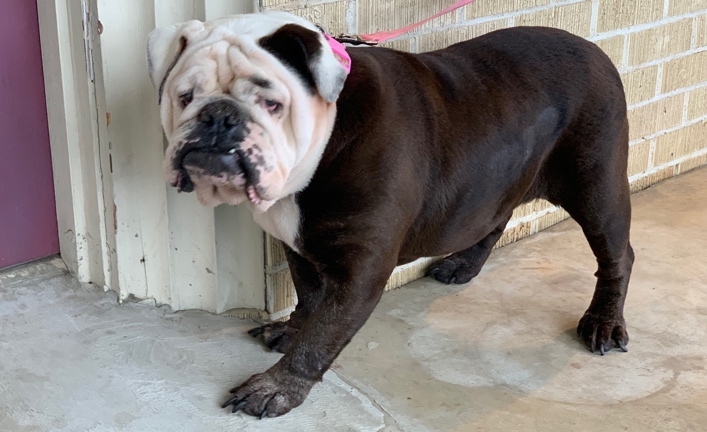 Hopefully, there is a family out there looking for a sweet, silly, little Bulldog girl who likes to PLAY – because here I am! And while you’re busy filling out your application to adopt, I’ll be busy PLAYING and waiting! 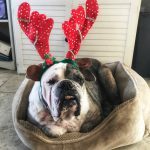 12/31/17 Update: Betty Boo (sorry, we just can’t call her Ginger!) is still PLAYING and waiting for her forever family! 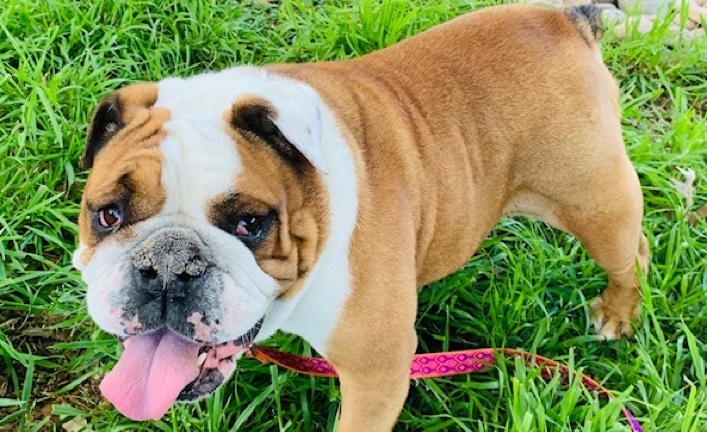 Betty Boo (Ginger) is a sweet, loving, happy, PLAYFUL gal that gets along with everybody in her foster family (dogs, cats, even chickens). You could never tell by watching her play that she walks with a wonky gait and sometimes a limp due to a previously broken toe and unstable luxating patella. Doc has her on a joint supplement to see if that helps her. Betty Boo was not previously house trained and we are working on that. 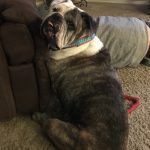 So where is that sweet, loving, happy, PLAYFUL family that is looking for the same in a Bulldog? She’s right here, waiting and PLAYING! 1/27/18 Update: Ginger is still PLAYING while her forever family is looking for her. 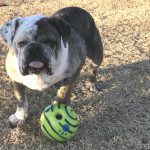 Are you looking for a very sweet Bulldog that loves to sleep, PLAY, and eat? Then Ginger is the girl for you. Go ahead and put your application in now. Ginger will be right here, PLAYING and patiently waiting for her perfect family! 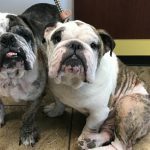 6/20/18 Update: Ginger is looking for a playmate! Who has a dog that loves to play and wrestle and jibber jab and run and chase giggle balls and needs a friend to do it with? 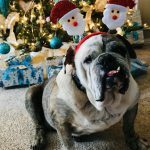 Well, Ginger is the Bulldog your family needs. And that is exactly what Ginger loves to do when she’s not being a normal Bulldog and sleeping the day away. She loves to play and unfortunately, none of the other furry critters in her foster home feel the same way. So, she just has to play all by herself until the perfect playmate comes looking for her. Ginger is a very sweet, loving girl and has been in rescue now for more than 6 months. We think it’s time for Ginger to find her forever family so she can play, and play, and play her way right into your hearts. 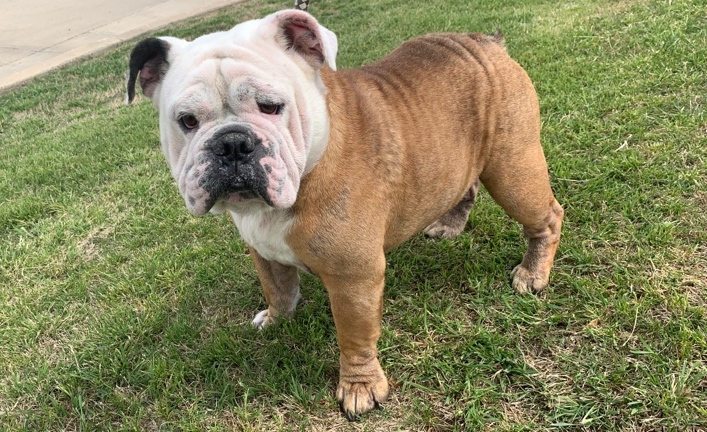 12/1/18 Update: Ginger – or The Boops, as in Betty Boops as we call her – has been in rescue for over a year now. This is the sweetest girl who wants nothing more than a forever playmate. She LOVES TO PLAY and her foster siblings just aren’t that playful, but she keeps trying. Maybe Santa will bring her a new playmate for Christmas?